Once again the Wiz finished the season with a terrible record, so now they are back in the hunt for the #1 pick. Last year I went to a bar (not to watch the lottery) and my brother started screaming. I was like WTF, and he said the Wiz got the #1 pick. That's when the John Wall chants started. (if a chant is when 2 guys yell someones name over and over with onlookers looking at you like you are nuts). So this year I am planning to watch intensely like when they open up the envelope at the Academy Awards, which means I will be terribly disappointed in the results (like when Lord of the Rings won best picture) due to my superstitious mindset. So with that I decided NOT to watch the lottery, but then thought "that's just what superstition wants me to do." Anyways this conundrum goes on to infinity and I'm not sure who will win the battle. Looking at the draft class, I like the guy from Arizona, but I think that someone later than the top 3 (Jimmer!!!) will have the highest impact. 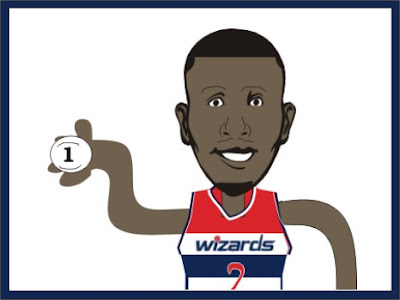 So what number will the Wiz end up with? Who will be passing the ball to Andray Blatche so he can turn it over next year? Let's Find Out!